← What Will it Cost For CarFreeBrad to Drive? GSOM Gala Recap. CarFreeBrad won an Award, sorta’! Last night was the Clark University Graduate School of Management Annual Year End Gala. It was at the Higgins Armory in Worcester which is a great venue with a ton of cool armor to play with and a cool exhibits everywhere. The DJ was good, food was outstanding and drinks were tasty. Overall, it was a great night and I’m pretty sure that fun was had by all. 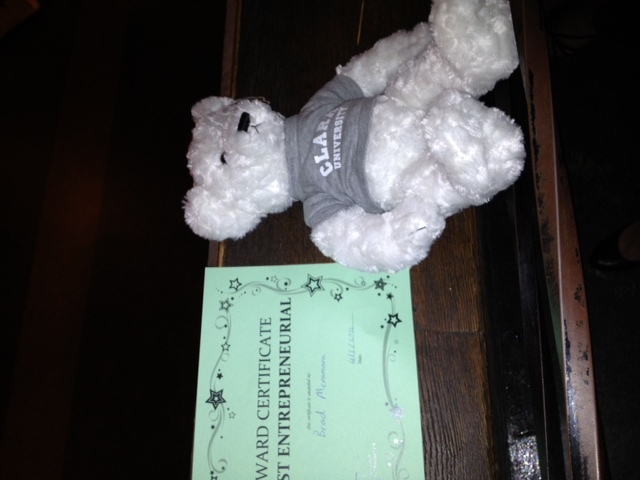 I was voted “Most Entrepreneurial” by my peers and I’m honored by the award. It’s really flattering to realize that my peers think enough of me to vote for me in this category. I’d like to thank everyone who worked so hard to coordinate the event and put together the awards. To be honest, I was surprised that enough people even knew who I was to vote for me. As it happens that was kind of a problem when it came to tallying the votes. I found out that there was a bit of confusion. Apparently, my fellow students don’t know exactly who I am. There were a number of variations of Brad voted for; carfreebrad, 2nd year Brad, Freight Farms Brad, Brad with no car, the 2nd year who rides a bike, etc. This entry was posted in Bike commute, Car Free, Urban Bike and tagged Business, CarFreeBrad.com, Clark University, Colleges and Universities, Freight Farms, Massachusetts, United States, Worcester. Bookmark the permalink.